Contextual integration is a great way to increase interest in your brand especially when your audience is not in-market for a new car, which let's be honest is just about everybody these days. Toyota realizes this as it is in the midst of launching the new Toyota Venza in a falling market. So, how do you get people to see your product in a positive financial light? You link up with Smart Money. 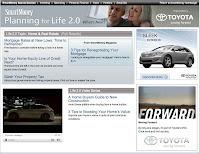 Toyota is running online media under the tag line "Planning for Life 2.0" which is a nod that life is changing, at least our financial life after losing half of our retirement, worrying about job loss, or going through foreclosure. Of course, the media is a bit more positive than I am. The execution looks at saving people money in how they plan their financial decisions, perhaps Toyota is hoping some better financial decisions about my home or my retirement might improve my situation and free up some money to buy a new SUV. There of course is no financial advice when it comes to your automotive purchase, since buying a $30k plus car isn't the best financial decision when you may or may not have a job next month. 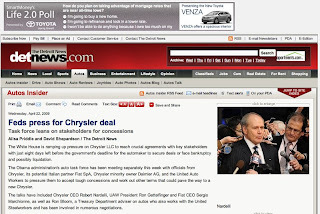 And Toyota has yet to follow some of its competitors with a Hyundai Assurance like promotion. Regardless of the financial decision benefits, it's about getting in people's natural path and people are very interested in better financial decisions. Maybe they mean, "Buy this instead of a Lexus RX 350." Can't say I've detected much buzz around the Venza. The media gave it good reviews, but the general public still doesn't know it exists...or care. The Venza is very bland. I think they have made it look too station wagon and not enough SUV. Sure the media loves it; it's a Toyota. ;) But the design has a lot to improve on.